I personally have a lot of hair. It's pretty darn thick, but that doesn't mean I haven't tried my hand at volumising goodies over the years. I'm clearly feeling in a big mane kinda mood, as I've decided to compress a little top five collection of my faves for doing the job. You don't necessarily have to splash the cash to get a good, reliable hair product, above I've intentionally included products to suit all budgets. So lets start with Bumble and Bumble, my go-to brand when it comes to the hair-shaped happenings of life. As you can see, I've featured them twice on this mini list, which I guess just shows how awesome the brand is. The Sunday Shampoo isn't designed to specifically volumise the hair, but it does. And boy does it do it well. Created to rid the scalp of nasty build-up, this leaves the hair feeling silky soft, and thanks to your freshly clarified scalp, big 'n' bouncy too. I've done a full review here if you fancy hearing a little more. 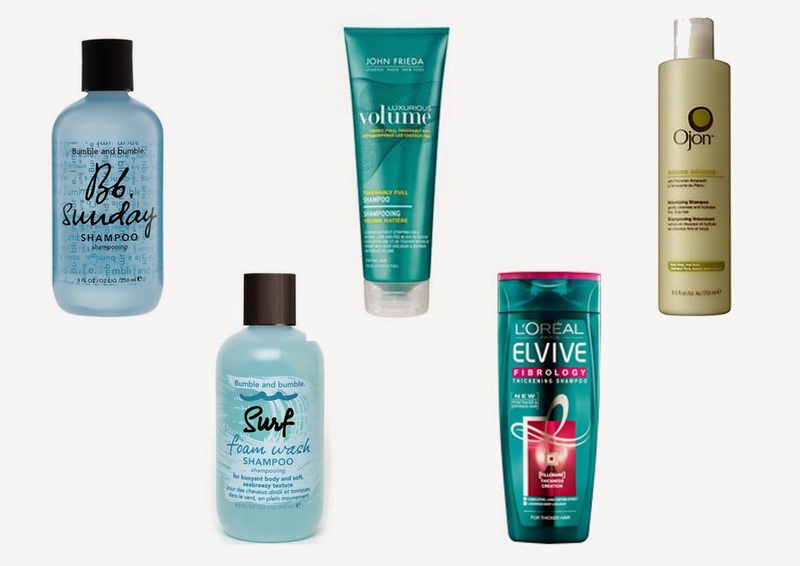 The next offering from the trusty Bumble and Bumble is the Surf Foam Wash Shampoo. Now this works totally different to the SS. This one is for those with serious henvy (hair envy) over those surfer beach babes you see within the world of Tumblr. A fairly new launch, this baby is seriously good. It adds texture, volume and waves all in one go, no need to mess around with any extra products when you've used this treat (minus conditioner, obvs). The only thing I'd say about this product is be careful to not get to addicted too you're new, surfer-esque barnet - it can be quite drying on the hair after a while. Next up is something a little less pricey. I first heard about the John Frieda Luxurious Volume Shampoo thanks to the fabulous Amelia Liana. Have you seen her hair? Yes? Well then you'll of course understand why I dashed to Boots as soon as I feasted my eyes upon her glowing review. At only £5.99, this product is a total bargain, leaving your hair super bouncy, super shiny and smelling b-e-a-utiful. So we've covered the more classic side of volumising shampoos, however this next gem is something a little more advanced. Think of it as the iPad of the hair world. The Loreal Elvive Fibrology Thickening Shampoo claims to literally thicken the hair. Now of course, you can't expect results over night, however the Filloxane within the product works to penetrate the hair strands, and to cut the story short, bulks them up. As I said previously, I already have pretty thick hair, so this product would be more suited to those who don't. But having said that, it does a top-notch job at leaving the hair with both body and bounce. If you're liking the sound of it, then I seriously suggest you nip to Boots pronto, as you can currently pick up a bottle for yourself for only £1.99 at Boots. Kerching. Finally, and something a little more costly, we have Ojon's Volume Advance Shampoo. This was my first, and admittedly only tamper with the Ojon range (I like trying shampoo, kay). What's great about this is that you literally only need a teaspoon-sized squirt for it to work it's magic, meaning it totally values out money-wise. Like the B&B Sunday Shampoo, it also has clarifying properties, and when you combine that with the hair-raising claims of the product, you can imagine the cocktail of bouncy locks that you're left with. So there we have it. My collection of thumbs-up, big hair approvals. Are you a fan of voluminous locks? What are your favourite hair products?